Social media has had as much impact on companies and their customers as any technological advance ever, because social fundamentally changes the relationship between those parties from its historical norm – which is “master” and “servant” – to something closer to a relationship among peers. Social has given customers a voice, and business will never be the same. Customers can punish or praise companies within seconds from the palms of their hands, and those communications can (at times) result in meaningful changes to company policy and behavior. This fundamental disruption was first accompanied by a legion of new communication platforms like Facebook and Twitter, and then an extraordinary array of software, tools, and consultants birthed to govern or improve how companies navigated these uncharted new waters. This is why most companies today have Social Media Departments whose responsibility it is to use these new platforms to interact with customers and prospective customers, and to stay abreast of the boundless new software and best practices developed to optimize those interactions. But as we close out 2014 I’m starting to wonder if the era of the Social Media Department is winding down? Is social media marketing? Yes. Is social media advertising? Increasingly, yes. Is social media customer service? Very much so. Is social media market research? It should be. Is social media earned media, like public relations/communications? Often, yes. 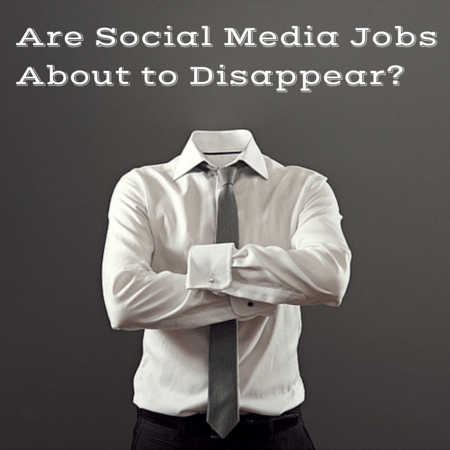 Is social media employee recruitment? Indirectly, yes. And in some companies/industries it’s a big part of direct recruiting. Is social media internal collaboration and process improvement? Yes-ish. Typically, we’d think of this as “social business,” and since it’s internal rather than external-facing I’d think of it as separate, but the tools and the systems are similar of course. How Long Can You Keep Something That Wants to Dissipate In Its Own Container? As social media touches more and more corners of the organization day-to-day, it becomes increasingly ungainly to encapsulate those activities into a freestanding department, doesn’t it? First, nearly all employees will be “social” in some fashion, and are trained to interact with customers (and one another) with speed and lack of prejudice about roles and process. Second, “social media” ceases to be a job other than for a small number of senior managers that oversee social implementation cross-departmentally, like Chief Customer Officers do today with their emphasis on horizontal optimization of customer experiences. Instead of the Social Media Department, other legacy departments like Customer Service, Market Research, and Communications will have members that manifestly focus on the “social media” components of their departmental responsibilities. 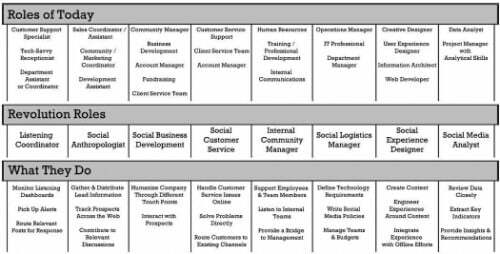 What you end up with is essentially a Center of Excellence model, but with nobody in the CoE except for senior managers spending 100% of their time in social. Certainly, there are companies that have already put this model into place. But it is definitely not the norm for most mid-sized and large organizations. But with social getting broader, and more complex, and more integral into the workings of the enterprise, this decentralized future of social media is right around the corner.